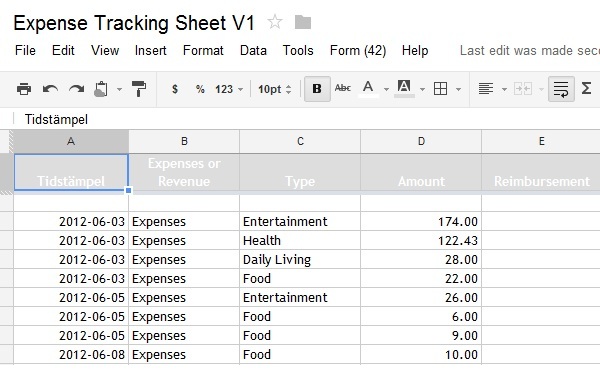 Want an easy way to track your expenses? This tip allows you to add data to a spreadsheet in Google Docs from a form. The spreadsheet is already setup so that it will sort out the expenses on a monthly basis on the following categories. It has some other features such as the tracking credit card expenditure as well. Open up the spreadsheet and try out using the sample form to see how it works. If you like it, make a copy to your Google Drive to try it out. Appreciate a comment if you find it useful! Thanks. Since 2007, I have tracked my assets, liabilities, revenue and expenses a.k.a a financial balance sheet. Clearly the balance sheet system works for it to be adopted by companies and thus shouldn’t we treat our own lives and finances with the same amount of rigour? After compiling the data, its time to review the data and look at the things that you are spending on. Perhaps you are spending quite a bit on electronics products? I’m guilty of that. Or how about the amount that you spend in restaurants? This system helps you be aware of where your money is spent and moderate your expenses if necessary. The addition of tracking assets and liabilities beyond the monthly income/expense allows me to analyse my networth growth, monthly profit/loss, and investment distribution ratio. This helps me track across a longer period the effectiveness of certain investments and allows me to determine if I’m anywhere nearer my financial goals. I have revolutionized my tracking system. It has grown from a simple spreadsheet to a Google spreadsheet so that it exists in the cloud. But thanks to Google Docs, I have improved the data system so that there are much lesser tweaking or data entry involved and have automated much of the process. So back to the spreadsheet, Google docs or drive allow you to use a web-form submission so you can access it anywhere on your mobile phone or on any device with a web browser to update your expenses without the need to access the spreadsheet. The web form is shown above and all you need to do is to enter the entry type and amount so that the data would then appear in the spreadsheet below. It makes it very easy on the go and functions like an app on your phone. I recommend to use a URL shorterner and to save it as a bookmark. From here on, the data is collected into the spreadsheet and you do not need to access this particular sheet. You can use this to add any records that you may have missed. The backend pulls the data into the next page which is the balance sheet and it would categorise your expenditure with category and monthly spending / earning records. Likewise, the PIE chart to show the percentage breakdown of spending is shown as well. Hope you find it useful! Let me know in the comments section if you have tips on how to improve it further, thanks!